Residential Permits are available to residents living in certain Downtown Beverly locations. 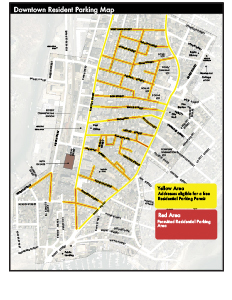 These locations are marked in yellow on the Resident Parking Map below. There is no cost for a Residential Permit. Residential Permits allow residents to park 24 hours a day seven days a week in the “4 hour time limit/Permit Parking” areas only. These locations are marked in red on the Resident Parking Map below. Parking spots are available on a first come first serve basis. Permitted vehicles are not guaranteed any particular spot at any particular time. All Parking Permits are issued electronically and are associated with each vehicle’s license plate number. No paper permits will be issued. Residential Permits are valid for one year and must be renewed before the annual expiration occurs to remain active. When applying for a Residential Permit, if the vehicle HAS been registered for more than a year in an eligible Downtown Beverly location, then no proof of residency is needed when applying. If the vehicle HAS NOT been registered for more than a year in an eligible Downtown Beverly location or the vehicle is leased, then proof of residency, such as a utility bill (from the past 45 days) or a copy of your driver’s license displaying your name and current downtown Beverly address will be required when applying. Residential permit holders will have the option of getting up to three 2-day guest parking passes per month. It’s easy! Click the red “Get a Permit” button above to obtain a permit. Paper applications are also available in the Collectors Office at City Hall. Employee Permits are available for employers and employees of certain Downtown Beverly Businesses that are located in the grey shaded areas on the Employee Parking Map below. Employee Permits are available for purchase in monthly ($25), quarterly ($75) and annual ($300) increments. Partial month, quarter or annual purchases will be sold at a pro-rated basis. Annual Employee Permits for the period of January 2019 to December 2019 will be available for purchase on December 1, 2018. Employee Permits allow Downtown Beverly Businesses employees to park 24 hours a day seven days a week in the “4 hour time limit/Permit Parking” areas and Municipal Parking Lots. These locations are marked in red and blue on the Employee Parking Map below. Employee Parking Permits must be renewed before expiration occurs for the permit to remain active. Businesses with an active city of Beverly Business License and who used their City-provided user name and password are not required to upload additional documentation when applying for Employee Permits. Businesses without a City –provided user name and password must upload a copy of their City of Beverly Business license or a limited liability Company (LLC) Certificate of Organization as proof of eligibility.